You know how things happen to you and you find yourself making up a story about it and basing your decisions and choices on the made up story? This used to happen to me often until I started becoming more aware and conscious about the stories I was making up in my head. It never occurred to me that a lot of the choices I was making about my life were automatic, patterned and sometimes even predictable. This is what we call habitual behaviours. We start forming these behaviours from a very early age and we learn most of them from our closest relationships in childhood. 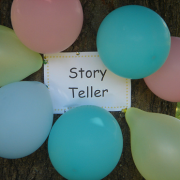 One of the biggest habits we have created in our lives is story formation. This is when we make up stories in our heads about a situation or life experience. We are hard-wired for story which means that every time something happens in our lives our brain immediately starts making up a story about it. The interesting thing is that it doesn’t matter to the brain whether the stories we are making up are true or not, the brain needs a good guy and a bad guy in order to be satisfied. And because the brain’s job is to protect us, we are always the good guy in the story and the other party or parties are the bad guys. This can present us with a problem because unless we can own our truth and our part in the story as it really is, we will make decision based on a false interpretation of a situation. So how do we challenge the stories we make up and get to the truth of situations that challenge us? “what’s really going on here” or “ what story am I making up about this” and we go inside of ourselves to find the answers we may be surprised to learn that there really is no bad guys in the story. 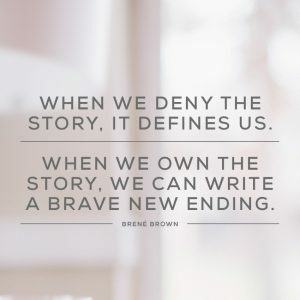 Brene Brown, a researcher who studies shame, vulnerability and connection says we should rumble with the story until we can find it’s truth and own it. What this means is that we need to check in with those who are part of the story to see if how we are interpreting their part in the story is true. For some of us this might be uncomfortable or awkward because we’de much rather believe the story we’ve made up than check in with others to confirm. In relationships that have little effect on our lives, this may not be such a big deal but when it comes to personal relationships like partners, parents, children, siblings etc there is so much more to lose by buying into the stories we make up without challenging their validity and truth. And what about the stories we make up about ourselves and our worth. Brene says “the most dangerous stories we make up are the narratives that diminish our inherent worthiness”. When we experience the disappointment of failure, the hurt of betrayal or the pain of loss, we make up stories about our worthiness to be loved and to belong. When we take the time to get curious, challenge the story and own our part in it, we get to write the ending and we get to choose how it shapes our future.